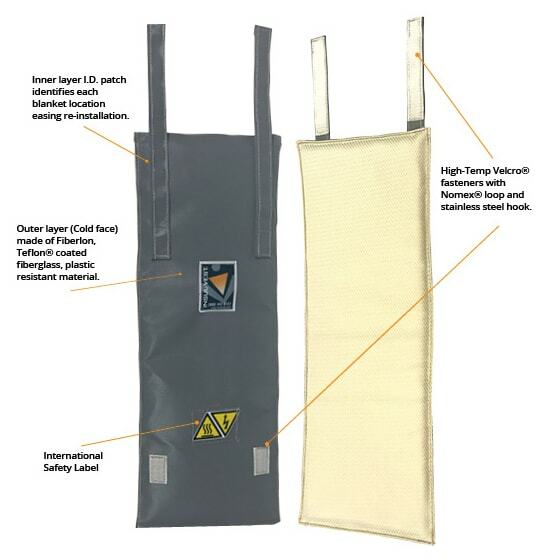 Insul-Vest Custom High-Temperature Insulation Blankets can be made to specific sizes, which create significant benefits of added safety, lower energy costs, greater product consistency, and a reduced heat stressed working environment. Custom Blankets are made of materials specifically designed for high temperature environments: high temperature hook and loop fasteners with stainless-steel hooks and Nomex® loop; insulating filler made of ceramic fiber, and interior lining of high-performance silica fabric. Materials can vary depending on application needs.